Yesterday I walked up the beach on the MOST glorious day to have lunch at the new Losers Bar Belize – “This Life Ain’t For Everyone” (that’s their motto) – in the Boca Del Rio neighborhood of San Pedro. Losers started building on the island last year with a flurry of controversy. A HUGE brand new dock in the once residential neighborhood, many – including the San Pedro town council – objected to its construction. The project moved ahead quickly. And the structure, just finalized a few weeks ago, is SERIOUS. Impressively and (from what I gather) expensively constructed and outfitted, I decided to stop in for lunch yesterday to see the final product! The bar is impressive if not a bit bland. But then…it just opened! 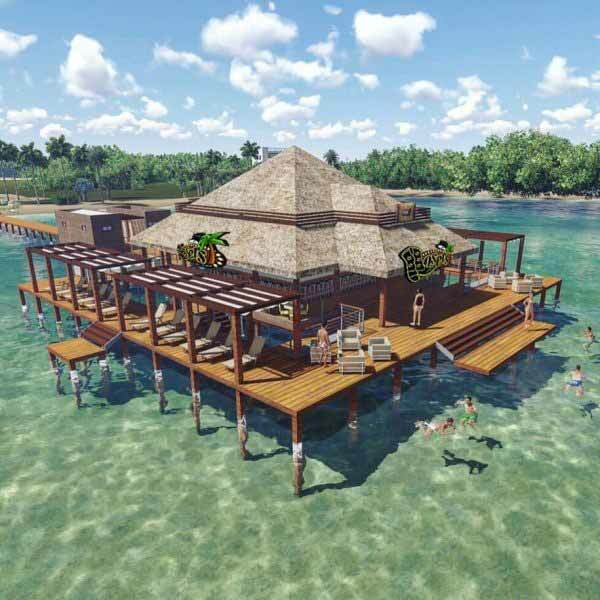 There is a HUGE bar wrapped around the kitchen… A swimming platform…lounge chairs… A neat loft area… And seating for a SERIOUS amount of people. My meal with good! – and not expensive – just over $20bzd for a big cheeseburger, fries and a soda water. My waitress was LOVELY – they have TONS of staff – and there weren’t tons of people there – so I got lots of attention.